When you will take your practical driving test, the Driver Tester will ask you to demonstrate a reverse on the Left Corner. Most pupils are dreading this manoeuvre for the Test. But if you prepare for this manoeuvre with practice and supervision with an Approved Driver Instructor (ADI), the manoeuvre can be done without stress. – Most importantly parking of the vehicle for the Manoeuvre is crucial, make sure that the vehicle is ½ length of a door from the kerb, 0,5 metres or 18 inches away from the curb. 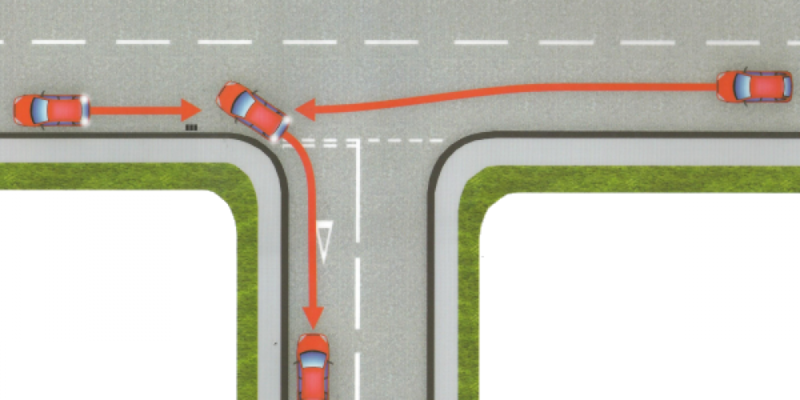 – The vehicle position to start the reverse will be 50 % of the Manoeuvre success. – Before starting to reverse, ensure that you are taking good observation. Look for any hazards. – Keep vehicle straight & turn in good time( Curb should been disappeared from Left wing Mirror). Check Blind Spot before turning Left & while turning left.On average, you will need to turn the steering wheel 3 times to make the turn on left corner. – When needed to straighten vehicle, turn the steering wheel in the opposite direction (a soon as the curb reappear in Left Wing Mirror). Count how many turns you made to the left, & turn the same amount of times on the right. – Keep reasonably close from the kerb (do not bump or mount the kerb). – Be prepared to stop if it is safe to do so. – Always wait until the Driver Tester ask you to stop before you do though. When the manoeuvre will be fully accomplished then you will be request to demonstrate Hands Sign.